Kyle finally received the 401(k) plan information from his new employer about 6 weeks after starting work. When he told me the plan offered American funds, my heart sank! The stereotype I have about American funds is that they have loads and high expense ratios. When we looked at the plan documentation, we didn’t find any load disclosures (thankfully), but the expense ratios were approximately an order of magnitude higher than what we have in our Vanguard funds. We were also concerned that perhaps the American funds might not be index funds – why would index funds have expense ratios of 1.5%? – because we are passive investors. When Kyle accepted this high-paying (to us) job, we assumed we would use his 401(k) plan for retirement savings from his income. For my variable income, we would use our IRAs and maybe increase his 401(k) contributions if needed. I was aware of the possibility of opening a retirement saving plan for my self-employment income, but I didn’t look into it very far because we had these other options. As soon as I saw that we would have to use American funds in the 401(k), I delved into learning about self-employment retirement plans. From reading descriptions of SEPs, individual 401(k)s, and SIMPLE IRAs and taking this quiz, I determined that an individual 401(k) plan would be best for us at this point with my business and contract work. With an individual 401(k) plan, I can maximize my contribution room as a lower earner. The contribution limit in 2015 is $18,000 plus 25% of additional net income up to $53,000. That means that if I earn $18,000 or less (probable for 2015), my contribution limit is 100% of my income. For every dollar that I earn between $18,000 and $158,000, my contribution room increases by 25 cents. From what I read, I can open an individual 401(k) with Vanguard (where we have our IRAs) for $20 per fund per year. That sounds great to us! It looks like – unless I start making an enormous amount of money or we want to save a much higher percentage of our gross income than our current goal – we can avoid using Kyle’s 401(k) entirely and save all the money we want to between the individual 401(k) and our IRAs. Kyle’s employer doesn’t offer a 401(k) match so there is no reason to enroll in the plan right now. (If there were a match, we would contribute just enough to maximize the match.) It’s a little tricky to determine the contribution limit on an individual 401(k) before the end of the year as my income for the year would be a bit of a moving target, but like IRAs we would be able to contribute to the individual 401(k) up through April 15 of the following year to maximize the contribution room. If we ever wanted to save more than the contribution room we were sure to have between the individual 401(k) and the IRAs, we could still enroll in the 401(k) plan. It’s not horrible enough to forgo the tax-advantaged status, especially because when Kyle moves to his next job we can roll everything into an IRA. I think I kind of freaked out about the plan because there has been so much in the personal finance news in recent years about fee disclosures for 401(k) plans and employers being sued for not providing properly diversified 401(k) plans. Ric Edelman regularly recommends that people point out sub-par 401(k) plans to their employers and advocate for change, but I’m not sure if this plan is bad enough to go that far. Then again, at a small start-up, Kyle might be able to effect change if a few of his co-workers agree with him. Are you dissatisfied with your employer’s retirement plan? How do your 401(k) expense ratios compare with Edward Jones’s or Vanguard’s? 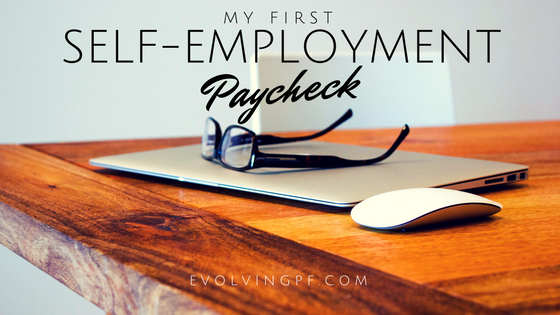 Do you use a self-employment retirement account? If you could open a retirement account with any brokerage firm, which would you choose? 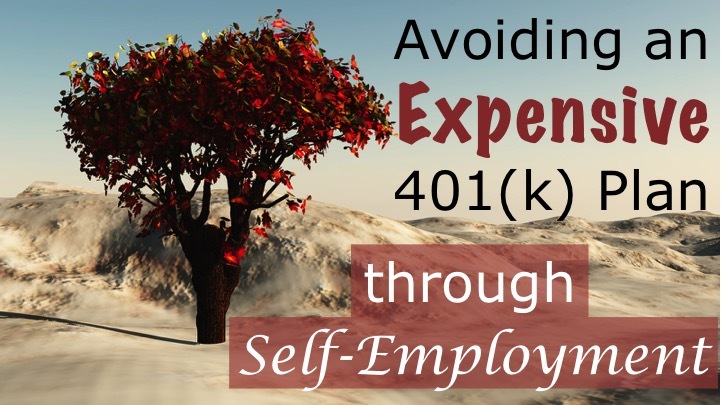 19 Responses to "Avoiding an Expensive 401(k) Plan through Self-Employment"
That’s unfortunate about your 401k at your husband’s work. I definitely would speak up to the company about how sub par they are. We used to have Nationwide and my company switched to Standard which had better rates and offered Vanguard funds. It’s not as cheap as using Vanguard directly, and I don’t know why we don’t (as we’re in PA, close to Vanguard’s home–I think it has something to do with some bad press some higher ups at Vanguard faced in the courts) but at least the rates aren’t bad and the program is way better than Nationwide. 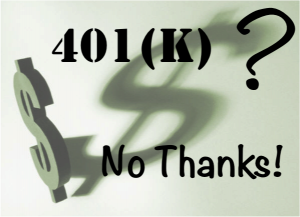 Change can happen for a work’s 401k program so it’s worth mentioning to the HR department. That’s good to hear that your company switched to give you better options – there is hope! But yeah there’s no HR. 🙂 If Kyle brings it up, it’s going to be to the co-founder who is taking point on coordinating the plan! Ugh Edward Jones is AWFUL. I agree with mentioning this to HR. The only reason DH’s small company has a match is because he asked about it. He didn’t even request, just asked as a new employee. This is also why they have started an annual system for raises. DH also does not have great options, so we only contribute to the match. But still better than what you are talking about. But it is pretty easy to max out my Fidelity 403b and my 457 instead. That is really great that the matching benefit materialized after your husband inquired! Kyle’s been told multiple times that a match is not offered. Maybe as the company grows more of these policies will be worked out. That’s quite a lot of contribution room between the 403(b) and the 457! It’s nice to have these alternatives. I feel kinda bad because presumably not all of Kyle’s coworkers have a choice. Yup from what I’ve seen on Bogleheads and MMM forums, a markup by the 401k provider is typical. Once you hit your maximum employee contribution to your 401k, you should probably invest in Kyle’s 401k despite the high fees–the tax advantages are probably still worth it, per above. I mean, as much as you and Kyle hope that the startup he’s working for will succeed, it’s statistically not likely. Oh yeah one thing to note – if Kyle is legitimately doing work for your business (and he does maintain this website right?) then he too can contribute to the solo 401k because he’s your spouse. If he were to do this then he has to keep in mind that his 401k employee contribution limit is across all his 401k’s—that is, if he contributes $10k to his work 401k he could only put in $8k to the solo 401k as an employee. (Note I keep saying as an employee – employer contribution limits are per business). However, this only makes sense if you put in $18k as an employee and you still have self employment earnings left over. Have you guys decided on where to open the solo 401k? Vanguard doesn’t offer admiral shares in their solo 401k offerings…and I think they don’t allow for rollovers or something like that. I hadn’t really considered that there is really a point – I guess it’s a function of length of employment, per your quote – where it would ever become advantageous to not use a tax-advantaged account, at least for a young person. If we max out the individual 401(k) and the IRAs we will definitely contribute to Kyle’s 401(k). I just don’t see that happening on the horizon given our incomes and our desired retirement savings rate. That is a good point about Kyle being an employee of the business. He does a bit of work on the technical support side of things for the websites and now my video production. We might want to start officially documenting his involvement somehow so we can treat him as an employee in the future, if it’s advantageous. No, I haven’t opened the account yet or totally decided. I just checked to see how expensive Vanguard would be. I should to a thorough job of comparing across a few brokerage firms. Thanks for your insights! From what I’ve generally seen, 401(k) plans offered by startups are TERRIBLE. So I was expecting this. They can be expensive-ish to run and with few employees and fewer even contributing to it, there isn’t much incentive for the employer to offer a good one. I’m with Nicoleandmaggie for possibly asking about it though. I would definitely be using Kyle’s 401(k) if you need to to contribute your desired amount for retirement because a) you have no idea how long he will be at the startup, b) the plan can always improve, and c) the tax deductions are great. You guys might possibly even want to use Roth 401(k) contributions for both of you this year since you’ll only be making reasonable income for half the year. My last plan had no index funds when I joined the company. My current plan is through Fidelity, which is pretty good. I have access to the BrokerageLink feature for no fees at all, which means I can invest it whatever I want that is a Fidelity fund. So I picked the Spartan index funds, which are similar to Vanguard’s. I would be curious to learn why they picked this plan. Presumably it is cost-saving for the company… but the founders work for the company too (3 of the 10 employees), so as employees I would think they would want a good plan, too. It would be interesting! Kyle’s 401(k) has Roth and traditional options and when I open an individual 401(k), mine will, too. We’re definitely going to stick with Roth contributions in 2015 as we’ll still be in the 15% tax bracket. For 2016 we might switch to traditional or do a combination of Roth and traditional. We’ll see how my business income goes for the fall and make some predictions for 2016 at the start of the year. I definitely wouldn’t mind having a Fidelity plan! That is really good. I’m sorry to hear you didn’t have access to index funds at first… I’ll have to look more closely to see what these American funds actually are. 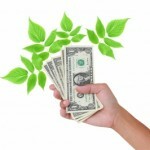 TFB has a bunch of posts on Solo 401(k)s: http://thefinancebuff.com/tag/solo-401k including a post on the various providers: http://thefinancebuff.com/solo-401k-provider-service-scope.html I highly recommend you check that out! Thanks for the recommendation! I’m glad to not have to search for my first high-quality source. Emily, what I know is that employees believe that higher fees guarantee higher returns when the opposite is true. Lower fee index funds often have higher net returns than higher fee actively managed funds. Sometimes I forget that anyone has been taken in by the false assumptions/advertisements of active management!